You are here: Home / Arthur Diehl: "Friends, I Greet You!" 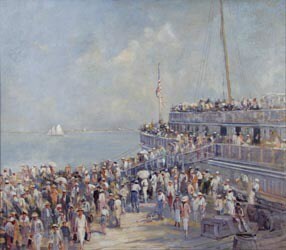 Once known as “The Champion Speed Painter of America,” Arthur Diehl was an artist, entertainer and philosopher whose studio was a bustling tourist spot in early 20th century America. His photographic memory and tremendous technical skill made him a favorite of everyday art lovers at a time when other artists were moving towards a more modern aesthetic. This exhibition explores the life and work of a man who found success by opening his doors, inviting in the public and spreading good will along with affordable paintings. A visit to Arthur Diehl’s studio was a full entertainment experience. Diehl kept a piano on hand and during painting breaks he would play and sing. He also sang while painting, and especially loved songs by the Scottish entertainer, Harry Lauder. More often, though, he “philosophized” while he worked. His favorite topics were chemistry, physics, English, and history as well as art, modernism, and Marxism versus capitalism. His studio was nicknamed “The Philosophy Shop” and every day he posted a saying with a bit of good advice, “One for Today,” in the studio window.